Kakaris Family Dentistry (Woodhaven) - Book Appointment Online! 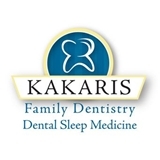 At Kakaris Family Dentistry, our team is dedicated to you and your family’s dental health. We welcome you to stop by and check out our facilities and meet our staff. We look forward to working with you! We are proud to have served patients in our community for over 20 years. Through continuing education and state-of-the-art equipment, we are able to offer you and your family the highest level of dental care.